Upcoming 14-story, 356,500 square foot mixed-use building that will contain approximately 273 residential units, including 172 rental apartments and 101 ownership condominiums, and approximately 8,500 square feet of ground-floor retail. Resident amenities at 370-380 Harrison Avenue will include upper-level roof decks with outdoor social space and plantings. 55 residences at 370-380 Harrison Avenue will be designated affordable, including 52 apartments and three condominiums. Three levels of parking will be built underneath the building with a total of 180 spaces. 370-380 Harrison Avenue will be built to LEED Silver energy-efficiency specifications. Work continues on the concrete mat slab for the upcoming mixed-use building at the corner of Harrison and East Berkeley Street in the South End. The tower crane is also in place for the 14-story project. The building will feature a total of 273 residences, a mix of rentals and condos, along with 8,500sf of ground floor retail. An electrical permit has been issued for the upcoming 14-story mixed-use project on Harrison Ave. in the South End. The project is set to include 273 residential units (172 apartments and 101 condos), along with 8,500 square feet of ground-floor retail. Resident amenities at 370-380 Harrison Avenue will include upper level roof decks with outdoor social space and plantings. Three levels of parking are being built underneath the building to feature a total of 180 spaces. Site work continues at 370-380 Harrison Avenue in Boston’s South End. The upcoming 14-story, 356,500 square foot mixed-use building will contain approximately 273 residential units, including 172 rental apartments and 101 ownership condominiums. Additionally, there will be approximately 8,500 square feet of ground-floor retail space. Resident amenities at 370-380 Harrison Avenue will include upper-level roof decks with outdoor social space and plantings. 55 residences at 370-380 Harrison Avenue will be designated affordable, including 52 apartments and three condominiums. JDC Demolition Company has begun soil remediation at 370-380 Harrison Avenue in Boston’s South End, the future site of a 14-story, 356,500 square foot mixed-use building that will contain approximately 273 residential units, including 172 rental apartments and 101 ownership condominiums, and approximately 8,500 square feet of ground-floor retail. Demolition of the Ho Kong Bean Sprouts and Quinzani’s Bakery factory buildings are complete to make way for 370-380 Harrison Avenue, an upcoming 14-story, 356,500-square-foot apartment and condominium building. A new construction permit has been issued to begin the building which will feature 273 residences, including 172 rental apartments and 101 ownership condominiums, and approximately 8,500 square feet of ground-floor retail. The project is expected to take two years to complete. 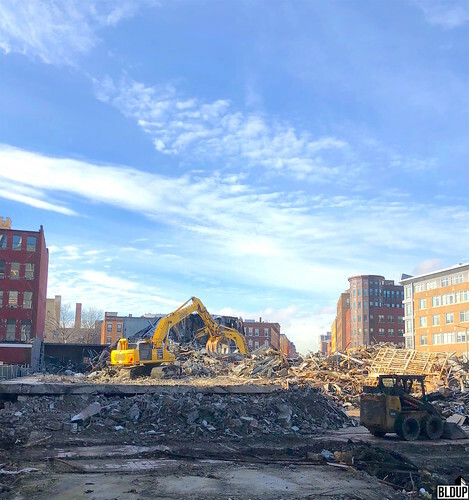 The former Ho Kong Bean Sprouts and Quinzani’s Bakery factory buildings in the Upper South End have been fully demolished to make way for 370-380 Harrison Avenue, an upcoming 14-story, 356,500-square-foot apartment and condominium building. In the coming weeks, demolition rubble will be cleared, and pre-trenching and excavation of the building’s foundation and three-level, 180-space underground parking garage will commence. Fencing has been erected around the perimeter of 370-380 Harrison Avenue in the South End’s New York Streets neighborhood, future site of a 14-story, 356,500-square-foot apartment and condominium building, and demolition of existing buildings is expected to commence this week. The existing Ho Kong Bean Sprouts and Quinzani’s Bakery buildings will be fully demolished over the next four weeks. Pre-trenching and excavation of the future building’s foundation is expected to commence in early March, and continue through late July. Overall, construction of the building is expected to last approximately two years, with completion expected in 2020. 370-380 Harrison Avenue will feature 273 residences, including 172 rental apartments and 101 ownership condominiums, and approximately 8,500 square feet of ground-floor retail. 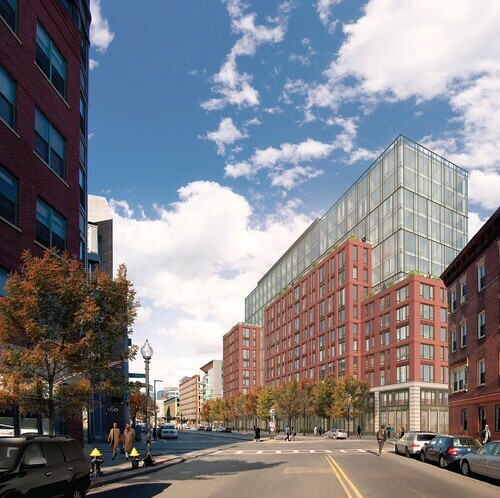 370-380 Harrison Avenue, a new 14-story building featuring 218 rental apartments, 96 ownership condominiums and approximately 8,500 square feet of ground-floor retail, was approved at last Thursday (March 2nd)’s Boston Planning & Development Agency (BPDA) Board Meeting. Developer Related Beal anticipates to start construction of the project in the second quarter of this year, with completion expected by the second quarter of 2019. Related Beal is proposing a revised development at 370-380 Harrison Avenue in the South End's New York Streets neighborhood. The design of the original development, proposed in March 2016 and not approved, has been revised in response to design feedback from officials and the surrounding community. With the revised design, Related Beal aims to better relate with the existing surrounding building context. Related Beal has submitted a Draft Project Impact Report (DPIR) to the Boston Planning & Development Agency (BPDA) with the revised development plan for 370-380 Harrison Avenue. The plan will now undergo official review. Related Beal proposes to construct a 14-story mixed-use building with 280 residential units and 6,000 square feet of ground-floor retail space at the former Quinzani’s Bakery site at 370-380 Harrison Avenue in Boston’s South End. Approximately 105 units would be condominiums; approximately 175 would be rentals. Three stories of underground parking would be built with a total of 180 spaces. A Project Notification Form has been submitted to the Boston Redevelopment Authority with a full development proposal. Related Beal hopes to start construction in the second quarter of 2017. Related Beal filed a Letter of Intent with the Boston Redevelopment Authority on December 31st, 2015 to redevelop the 370-380 Harrison Avenue site. The following is a link to the Letter of Intent. The 370-380 Harrison Avenue site is located in an area of Boston's South End that is seeing significant development. Ink Block Phase One, Sepia at Ink Block and Troy Boston were recently completed; The Lucas, 345 Harrison, Siena at Ink Block and AC Hotel South End are currently under construction.